Before discussing dandruff causes and dandruff treatments, it is necessary to discuss what is dandruff. Dandruff or pityriasis capitis is a common problem affecting millions of people around the world. It is an embarrassing problem affecting the self-esteem of individuals. You would not immediately think that it is a skin care problem, but it has a great deal to do with skin. Causes for dandruff are linked to a chronic scalp disorder caused by excessive flaking of dead skin from the scalp. As part of the normal skin regeneration process, skin cells die and are replaced by new cells. These dead skin cells then flake off the surface of the skin. For many individuals, the size of these white or grey looking flakes of dead skin cells on the scalp are very small and not noticeable. However, for many others, the flakes are quite large and abundant. 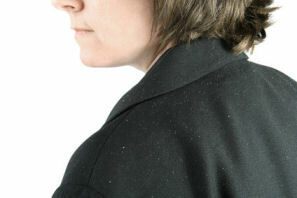 Dandruff suffers will notice an excessive amount of white flakes in the hair or on clothing throughout the day. In addition to a flaky scalp, other symptoms of dandruff are: itchy scalp, irritation, and scalp redness. Hair loss is not a result of a simple dandruff problem. However, improper use of products to treat dandruff may affect the hair. Individuals with dandruff shed the skin on their scalp a lot more frequently. Instead of shedding skin every month, dandruff suffers will shed skin every two weeks or less. There are a number of suspected reasons why the skin on the scalp sheds more frequently than it should. Of all the dandruff causes, the most common cause for dandruff is the presence of the Malassezia furfur fungus. This fungus is found on the surface of the skin on individuals with or without dandruff. The role of the fungus is to metabolize human fat. When this fungus grows too quickly, then the normal rate of skin cell regeneration is disturbed and dandruff appears. Causes of dandruff may also be linked to overactive oil glands or factors such as excessive sweating, family history, food allergies, use of alkaline or harsh soaps, certain hair products such as dyes, hair spray or hair gel, stress, yeast infections and environmental factors. For example, in wintertime the air is dry and cold and this can initiate the problem or intensify it. Exposure to UV light or too much dust are also causes for dandruff and may lead to the development of dandruff. Overall poor diet and poor nutrition can play a role in the dandruff equation as well. More specifically, it is suspected that a zinc deficiency can make an individual more vulnerable to the development of dandruff. Nuts, beans, turkey, red meat, pork, and shellfish such as oysters are good sources of zinc.